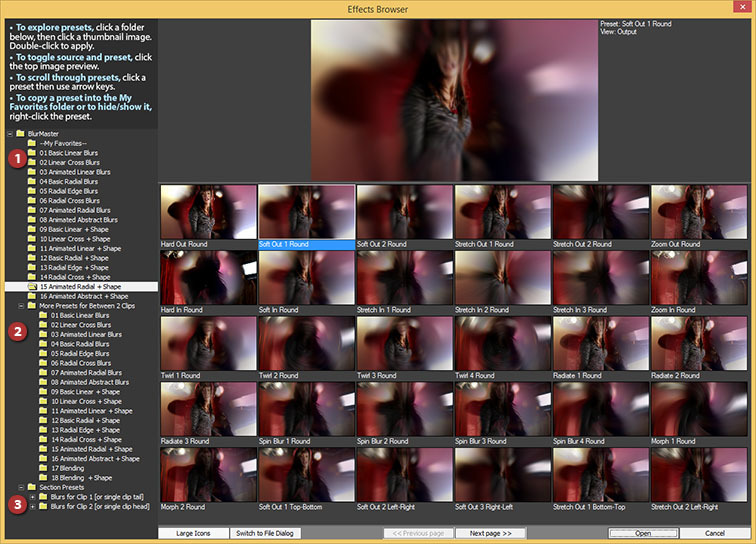 BlurMaster is applied like any plugin effect in Adobe After Effects (Windows, CS5 or later). (NOTE: We currently have no MAC plugins for After Effects, but may soon! Click here to be notified.) Simply drag-and-drop BlurMaster onto a timeline layer, from the Pixelan folder of the Effects and Presets panel of After Effects. See below for the basic steps to using this plugin. In a few minutes of seeing the below and then experimenting with the BlurMaster plugin, you will have much of the creative power of BlurMaster at hand for your projects. Note that all of this info is also available offline (for users who do not have Internet-connected editing stations) by clicking the FX Help button shown below. (1) Choose which layer you are transitioning to or from, using the Layer menu. It can be any layer in the comp; its Video switch can even be off. If the layer has effects or masks, precompose the layer first. If None is selected, BlurMaster will reveal lower tracks -- and some controls (like Blending) will have limited functionality. Note: To take full advantage of BlurMaster extras complete (1) and (2) before the next steps. Click here to visually choose from over 750 pre-made blur transitions (plus saved favorites) in an animated Effects Browser window. Click Recent to quickly load a recently used preset. Click Menu to quickly load an effect via a pop-up menu. Or Standard for an Open dialog box. (3) Use the Blur Clip 1/2 sections of the plugin to adjust main blur settings. To quickly try pre-made settings, click the Section Presets button -- a Pixelan exclusive! (4) If needed, untwirl other sections of the BlurMaster plugin to fine-tune further. Add blends, mix in a subtle iris or linear shape to influence the transition’s progression. * COOL TIP: To save time positioning section preset keys where two AE layers overlap: Make sure the Layer control in BlurMaster is set to your overlapping layer (i.e. 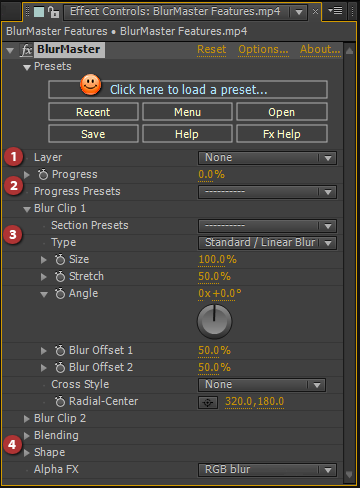 the other half of the transition), then choose a Progress preset within BlurMaster. The Progress keys will automatically be placed in just the overlap. Thereafter, you can choose any other section preset and its keys will likewise be correctly placed within the Progress keys. To temporary turn off this feature, Control-click a section preset. You’re done! To save the custom BlurMaster transition you've created for future use, click the Save button. A standard Save dialog will appear. We recommend saving in the "My effects" subfolder provided. Choose from over 750 pre-made professional effects in BlurMaster. There are THREE ways to access presets -- Effect Browser presets, AE Animation presets, and Section presets. The Effects Browser is fast, but sometimes you may already know which preset you want to use, such as when you are applying the same preset repeatedly in a project. In that situation, selecting a preset by one of the following methods can be faster... To see recently chosen Effects Browser presets, click the Recent button. For a drop-down menu of Effects Browser presets, click the Menu button. To use a standard Open file dialog box, click the Open button. • To scroll through presets in a folder while keeping your eye on the top preview image for comparison, click in the right panel then use left or right arrow keys. • To hide any preset, right-click the preset and choose Hide this preset. To show all hidden presets in a folder, right-click any preset in that folder and choose Restore all hidden presets here. To temporarily view the folder's hidden presets, which can be handy if you just want to momentarily browse them, choose Temporary show hidden presets. Our handy Preset menus for each section opens a quick menu of presets that change only the values in that section of BlurMaster controls. Use this unique feature to quickly and easily make hundreds of new effect variations. For example, try different Blur presets for Clip 1 and Clip 2 without affecting what you have set up in the other controls of BlurMaster. NOTE: In Blur sections you can make even a two-step adjusments. Select the "main" Blur settings from some submenu with a prefix "Step 1" and then try the offset presets in "Step 2 - Add Offset" submenu. If you prefer, you can save BlurMaster presets as animation presets in the usual place within After Effects, by selecting BlurMaster, then choosing Save Animation Preset from the Animation menu in After Effects or from the Effects & Presets panel menu. LayerChoose which layer you are transitioning to or from. It can be any layer in the comp; its Video switch can even be off. If the layer has effects or masks, precompose the layer first. If None is selected, BlurMaster will reveal lower tracks -- and some controls (like Blending) will have limited functionality. Progress Control the transition's progress over time, typically changing in value from 0 to 100. A typical linear transition is 100 to 0 at a layer’s head, or 0 to 100 at the tail. NOTE: If Layer>None is selected - only Blur Clip 1 is active. NOTE: If Layer>None is selected, some blending modes can produce irregular visual results. In this case, set the Blending slider to 0%. Tip: You still can use modes like Lighten and Darken to alter the transition brightness, experiment with Blending values outside the 0-100% range and use Glow conrols.